FP7 Combination of Collaborative projects and Coordination and Support Actions - Integrated Infrastructures Initiative project (I3) proposal (grant agreement: 246686, call: FP7-INFRASTRUCTURES-2009-1). The project is a key actor in the process of dissemination and uptake of the EU Open Access mandate. 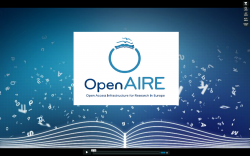 It aims at deploying and maintaining the OpenAIRE System, which enables the European Infrastructure for Open Access articles published under fundings from projects in the FP7. OpenAIRE offers a portal (www.openaire.eu) from which authors can deposit their articles, compliant Open Access repositories can register to be pro-actively harvested by the infrastructure, and users can search and access the articles or statistics on articles per project and per research area.